The 86 series service padlock is designed to be used with an half euro (10/30mm) locking cylinder available from many highstreet outlets and locksmiths. The padlock itself comes without a locking mechanism and a hollow space for your own locking cylinder to be fitted. This allows these padlocks to be matched to other locks and security systems using the same cylinders including front doors. New cylinders can be fitted easily without specialist tools but retain a high level of security once in place. 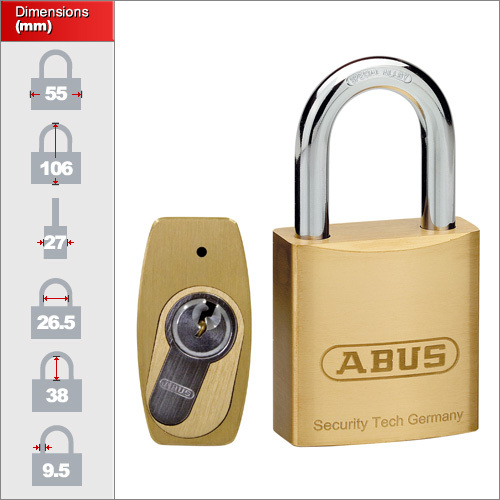 Due to the compatibility with the standard half euro cylinders we only offer one size of service padlock. Ideal for situations of convenience. A single site can be fitted with a complex master key arrangement and then the same cylinders can be used to fit these brass service padlocks for outhouses, garages, gates or rubbish disposals. Similarly, keyed alike arrangements can be created or added to easily. 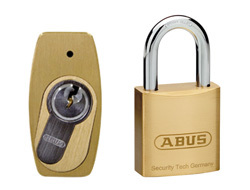 Even when a cylinder is damaged it can be replaced without changing the padlock body.